The PES franchise has made it to the next generation in PES 2015. Konami got quite a few things right in this soccer game. Is it enough to retain the crown against a surging Fifa franchise? Everyone has an opinion on which of these soccer games are better. While EA Sports has bought more licenses, teams, and contracts; Konami has spent their time and money making an impressive soccer game. The physics in PES 2015 are amazing to behold. I love watching the players because they are very realistic acting in PES 2015. PES 2015 impressed everyone here at Family Friendly Gaming with their musical selection. The majority of songs in PES 2015 are really good. The announcers are fun to listen to, especially when goals are being scored. Or a goal was just missed. These announcers are great in PES 2015. Graphically there is some good news for PES 2015, and some bad news. The good news is the players look great. The fields look great. The stadiums look wonderful. The bad news is the fans or supporters in the stadium are not that great. Plus there are things like the home team color wearing fans celebrating when I would go up 3 - 0. I was the away team. 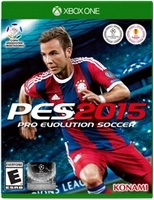 Family Friendly Gaming was initially provided a download code for PES 2015. This game clocks in at 19.1 gigs. That is so huge the editor in chief almost had a heart attack.We requested a physical copy and one was provided. Which we are very thankful for. Physical copies are better whenever a game goes over one gig. There are multiple difficulty settings in the various modes in PES 2015. This can help tailor the game for your skill set. Fifa does have better skill tweaking. PES 2015 does a great job with the different modes. The training is PES 2015 is open. So you can run around on a field and figure out how to play this sports game. It took me multiple games to get used to the control scheme in PES 2015. Some of the buttons like sprinting are in strange places. Once I was able to figure out how to play PES 2015 I had fun. The same can be said for the menu scheme. Much of it felt odd. Once I got used to it, then I was good. PES 2015 keeps the crown in Konami's court. The gap between Fifa and PES is tightening.